But that’s all over now. BHP Billiton (BHP), Rio Tinto (RIO) and Anglo American(AAUKY), all large global companies, have now removed the key managers "who did a less-than-perfect job" during the super cycle, he adds, citing poor capital allocation decisions. "The order of the day is to get the business right-sized," he says. Put another way, that means there’ll be a smaller supply of metals and minerals hitting the world market in the medium term. In case you forgot, lower supply when demand remains constant tends to mean higher prices. The wake-up call to management is also leading companies to make business plans that do not depend on prices of minerals rising. That means simply that projects are being started with an eye to a sustainable return on capital rather than what Wickwire calls "chasing production for production’s sake," as happened often during the supercycle. Misleading? Off course, but still kind of interesting. Note that America’s population has grown since 1961, but it hasn’t even come close to doubling. Meanwhile IP is up nearly 5-fold. PS. IP peaked at just under 46 in November 1973, generally regarded as the date when the post-WWII industrial boom ended. 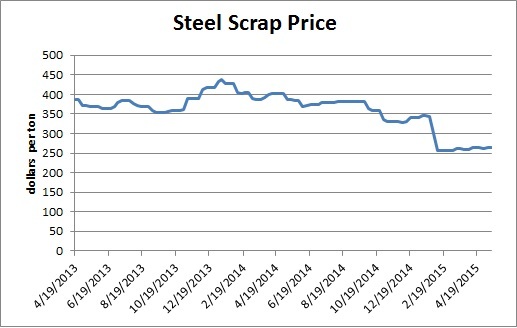 Scrap prices stable and low. 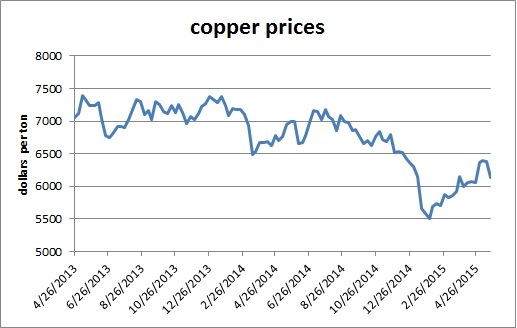 Copper prices show modest decline , still above bottom and still lower than recent prices. 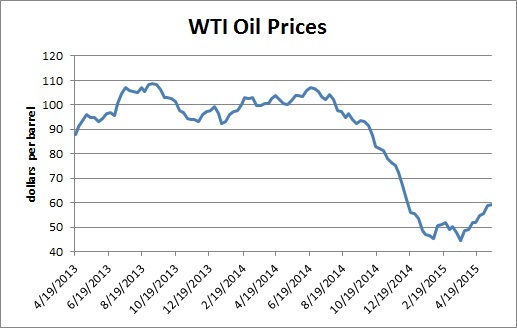 Oil prices also show modest increase still at low levels. 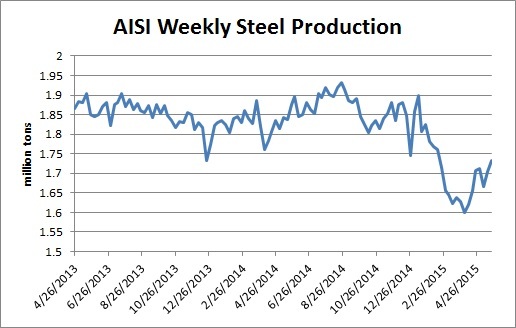 Steel production showing increase but still at low levels. Oil prices set to decline in third qtr. 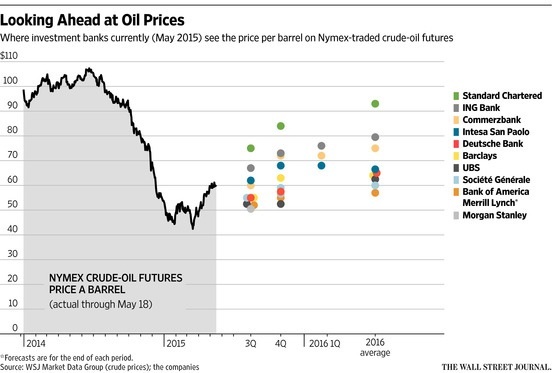 What’s next for oil prices? After rallying by about 40% since their lows earlier this year, forecasts now by major banks paint a mixed picture but one that increasingly looks like a W-shaped recovery. The average forecast in a MoneyBeat survey of 10 banks is for Brent, the global benchmark, to fall to an average of $63.35 a barrel in the third quarter of this year, down from around $66 on Tuesday. West Texas Intermediate, the U.S. marker, will average $58.40 a barrel next quarter, down from about $59 a barrel on Tuesday, according to the survey. 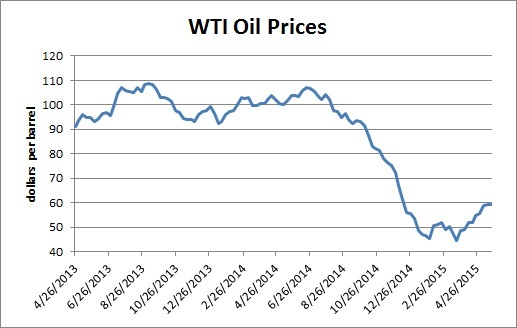 Oil prices also showing modest recovery but still at much lower level.